When we received a few first IP-based equipement in the EBU Technology & Innovation lab, we realized how manual and tedious it was to get IP gear up and running compared to the good old SDI technology. For system architects building IP-based facilities, the extra complexity, labour and time required add up very quickly. It became clear that SMPTE ST 2110 transport was necessary but not sufficient to build and manage a large scale facility. 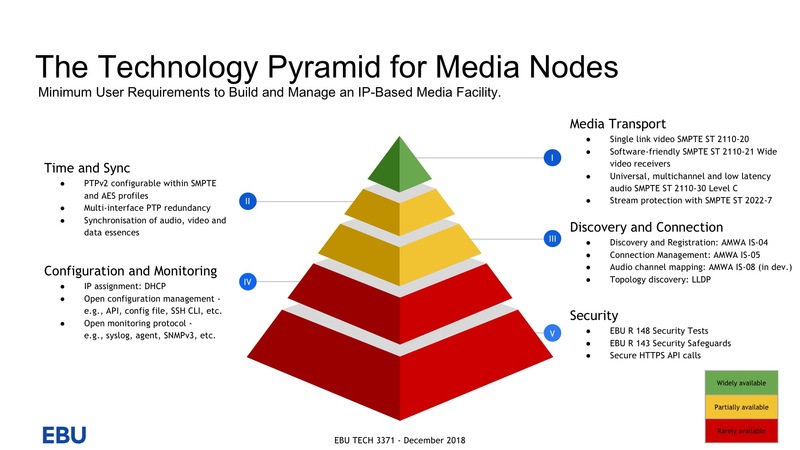 The Minimum User Requirements to Build and Manage an IP-Based Media Facility were formulated in EBU TECH 3371. The Joint-Task Force on Networked Media (JT-NM) – gathering the EBU, AMWA, SMPTE and VSF – has produced a technical recommendation that addresses a number of these user requirements. Please do find the document here. In order to achieve plug-and-play interoperability in ST-2110-based Live IP production infrastructures, a 'Full Stack' of protocols is sought. This slide details the 'Minimum Stack' of protocolls needed to achieve this goal. The New Builders Initiative is the forum for EBU Members to exchange ideas, insights, learnings and best-practice related to the design and planning of future-proof broadcast facilities. The Live IP Software Toolkit (LIST) enables advanced measurements in IP-based live video production facilities. EBU Members are exchanging experiences with and best practices for using Non-Linear Editing (NLE) systems. Pose your question here!